There is music to enjoy at St Leonard’s Church, Spital on Friday, March 10. After two sell-out events, Spital Arts Group is proud to present first rate local musicians with the Acorn Roots percussionist Robin Pardo and singer Emmi Manteau both brought up in Spital. 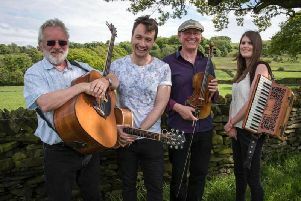 Acorn Roots are building a great reputation in Derbyshire as a lively and talented folk reggae, Celtic pop band, so there will be something for everyone to enjoy. They are supported by Spital’s own Emmi Manteau, singer with the north west band Baby Brave, and Laura Leigh of Heal The Last Stand so it’s a highly impressive line-up. The church is on Hartington Road/Valley Road, Spital, Chesterfield.